Editor's Note: George B. ('16) enjoys a good puzzle. He also likes circles. He combined these two interests in a puzzle-solving-rotating-circle quest. Read about it here. 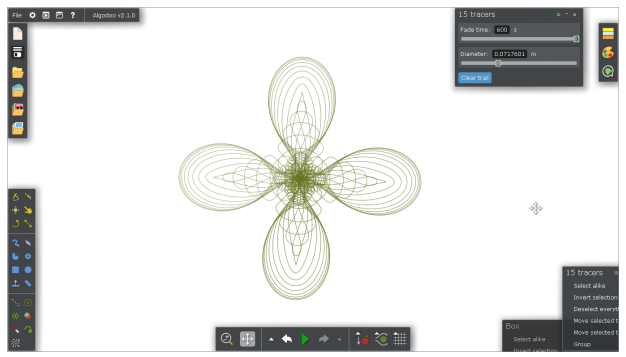 Why is this pattern made with rotating circles? Why are there four similar patterns made? In order to explore these concepts I will start on the smallest scale possible and record my results. Through a thorough meddling and tweaking of circles rotating around each other, I have come to many conclusions about what patterns are made and why they are made (to a certain extent). I have also discovered that the limitations of the program I am using have prevented a thorough research into what I think is an important part of the patterns. This is the basic setup I used for each experiment. 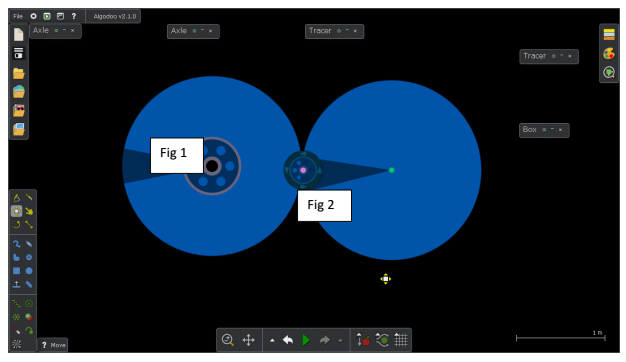 One circle is fixed to the ‘background’ and rotates around its center point (fig1). The second circle is supposed to be attached via motor at the tangent point, but only theoretically (fig2). The two circles had to overlap slightly to be attached so they weren’t truly tangent to each other. This is what I believe led to many problems I encountered later on in the experiments. When I initially started my experiment I used the same RPM in both of the motors and just changed if the motors were rotating clockwise, c-clockwise, free to rotate, or completely stopped. After testing all notable changes I would move on to changing the radius size (area) or the mass, which directly affected inertia. The only very interesting patterns came from the inertia based experiments which were all based on having one motor able to move freely. This allowed it to be influenced by the momentum of the other circle and move in a certain way. Unfortunately I found that towards the end of the trials these inertia based experiments became sporadic and seemingly chaotic with no repeating pattern to observe. Since these were the only significant differences in patterns when I changed the mass and area, I decided to observe the patterns in a different way. 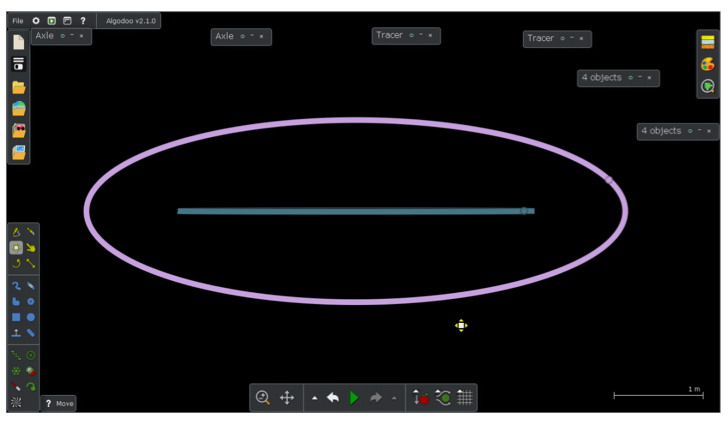 To track the patterns I put a tracer on the center second circle to track its movement. The following data reports are probably telling of some sort of pattern between radius size and mass, but because it was so complicated and difficult I decided to move onto a much more reliable way of experimentation. Inertia is also a much harder concept to track in an x-y plane so I instead went to RPM as my independent variable. Frankly the only thing I can say about the above data is that a difference of mass will greatly effect how many similarities are apparnt in the pattern, while the radius size will only change the shape of the pattern. As you can also see in experiment 2, the patterns started to become chatorics when I tweaked the mass, which disallowed further research into the topic. RPM will take mass out of the equation because the motors will be turning the circles and inertia will not be in effect. This also explains why 15 RPM is the exact same pattern as 30 RPM. The 30 RPM makes three loops in one full base rotation since 120 degrees goes into 360 degrees evenly three times. As for the 15 RPM circle, it fully rotates at 240 degrees instead of 120 degrees. But when the base circle goes onto its second rotation the second circle is able to make two more full rotations since 240 + 240 + 240 = 720. So the 15 RPM second circle is able to make 3 loops just as the 30 RPM second circle was as well. It should also be noted that 20 RPM is actually an oval, just shrunk incredibly small because the tracer I put is so close to the center of the circle. I added a second tracer further down the second circle to show this effect. 1 I will refer to similarities much more throughout this paper. Similarities in my mind are how many repetition of the pattern are apparent. So for the above pattern it will have 4 similarities because it has 4 of the same parts repeated. 2 I don’t really know the technical term for this. But when it is 15/10 and the answer is 1.5 the amount of loops is actually 3, so we should multiply it by 2. Or 22.5/10 the actual number of loops is 9 so we multiply 2.25 * 2 * 2.